Wine Poached Pears are an easy, light, delicious dessert that will impress and delight your guests! It is believed that the pear originated in Asia and gradually made its way to The Old World–Europe and Africa. As the pear reached Europe, it was widely accepted as a delicacy. Interestingly, it was also accepted as the fruit of choice for masterpiece artists’ painting still life scenes, due to its unique shape and silhouette. Some say the French brought the pear to the States, and others claim it was the Belgians. Nonetheless, at that time, pears were considered a valuable commodity among the trading routes. Eventually, in the 1800’s the pear tree was brought to Oregon and Washington where now, over 80% of the nation’s pears are harvested. The European culinary community was wild about the pear and began to experiment with the beautiful fruit. The beauty of the pear is that it has a delicious, buttery flavor, medium texture and a long storage life. Today, pears are incorporated into salads, presented on cheese boards, and served as dessert. Pears are naturally sodium, gluten, fat and cholesterol-free, making them another “super food”. A medium-sized pear has about 100 calories and is very high in Vitamin C, fiber and potassium. Vitamin C is essential for cell growth and repair, maintaining metabolism and promoting healing. Because pears are a nutrient dense food, high in fiber and water, they provide us with a feeling of satiety, or fullness. Pears are categorized as summer or winter varieties. Summer varieties are harvested in August; winter varieties are harvested from late August through October. There are roughly ten varieties of pears that are popular in the United States. These varieties are: Green Anjou, Red Anjou, Bartlett, Red Bartlett, Bosc, Comice, Concorde, Forelle, Seckel, and Starkrimson. While all pears are naturally sweet, some are sweeter than others. The sweetest pear is Comice. Bartlett, Starkrimson and Concord follow in a second group of being very sweet and juicy; however, the Concorde is sweet and crisp. The next group includes the Anjou, Bosc and Seckel. This group is relatively sweet; the Bosc and Seckel are more crisp than juicy. The Forelle pear is the least sweet and somewhat crispy. Asian pears are rounder than the varieties mentioned here and are much more crispy and crunchy, like an apple. For this reason, most salads feature Asian pears ,usually accompanied with bleu or Gorgonzola cheese and walnuts. Who says dessert has to be fattening and unhealthy? Wine Poached Pears are the perfect finale to a meal and are also delicious for a light brunch. Garnish with a spoonful of marscapone cheese and garnish with a curl of lemon zest (to make the lemon curl, use a potato peeler and go around the perimeter of the lemon removing a thin layer of the skin.) Twist and place on top of marscapone. 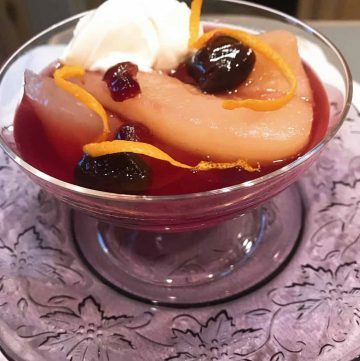 Wine Poached Pears are an elegant, light dessert we inherited from France! If you like, add a few nuts to top it off. If you prefer, substitute the wine with apple juice or cider. Another recipe you might like is peach cobbler!